Photo: Our youth in the after-school care program are happy to help prepare and serve the younger children fresh-cooked meals before concluding the program schedule. Today we bring you good news from our Children’s Hope Center after-school care program in the Payatas Landfill Colony of Manila, Philippines. We currently have 60 children enrolled who continue to study math, English, their native Filipino language, science, social studies, technology, and skill development in grades 1-6, and algebra, geometry, English, the Filipino language, biology, chemistry, physics, social studies, technology, and skill development in junior high until the academic year ends in March. The children receive homework tutoring for these subjects from our 5 faithful volunteers at the Hope Center, and we also provide nutrition support for the children by giving them snacks and a fresh-cooked meal, such as rice, soup prepared with beans and local vegetables, bread, and champorado (sweet chocolate rice porridge) before going home for the day. As we’ve focused on the problem of illiteracy amongst impoverished children — an important part of our weekly after-school care program which has proven so successful in our other Children’s Hope Centers — we have been very encouraged by the positive results. Most of the children were below average in reading and composition when we began the program, but after evaluation and assessment, we have discovered major improvements in their reading and writing skills. Half of the children (ages 6-8) can now read well in their native Filipino language and are beginning to excel in reading and writing in English. Other children (ages 9-11) are also improving in reading English — although there are still words they find difficult to read and understand, we are happy that they are trying so hard to learn. The remainder of our children (ages 12-16) can construct English essays and learn vocabulary words, but they are still having some difficulties in speaking English aloud. We are proud of their progress and we are thankful to share our knowledge with them — some of the parents of these children cannot teach them because they are illiterate and were not able to finish elementary school. In addition, there are students who do not easily cope with our English lessons but excel in mathematics. Thus, we also focus on teaching math to the students, but we prioritize teaching reading, writing, and speaking the Filipino and English languages and the children keep improving. When the children are not studying, they enjoy playing fun, local street games such as Batuhan Bola (dodge ball) and Patintero. 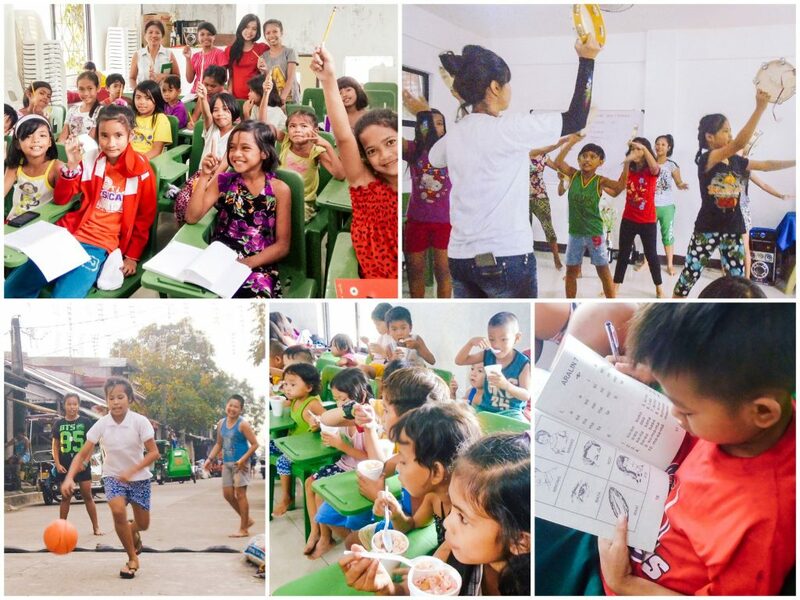 Photo inset: (Top-left): Children at our Manila Hope Center receive tutoring for their studies from our faithful volunteers. (Top-right): Fifteen children at our Hope Center recently learned tambourine dancing which they will perform at gatherings and presentations. (Bottom-right): Thanks to the literacy program at our Manila Hope Center, major improvements have been made in the reading and writing skills of the enrolled children. (Bottom-center): In addition to tutoring, our Hope Center program provides nutritious meals and snacks for the children. (Bottom-left): Children take a break from their studies at the Hope Center to play local street games. Today we also want to share the redemptive story of a child who is enrolled at our Manila Children’s Hope Center, 17-year-old Liezel. * She recently stopped attending school this year after completing the 10th grade. Senior high school (11th and 12th grades) are not covered by government and education in the Philippines is not easily accessible, especially for impoverished children. 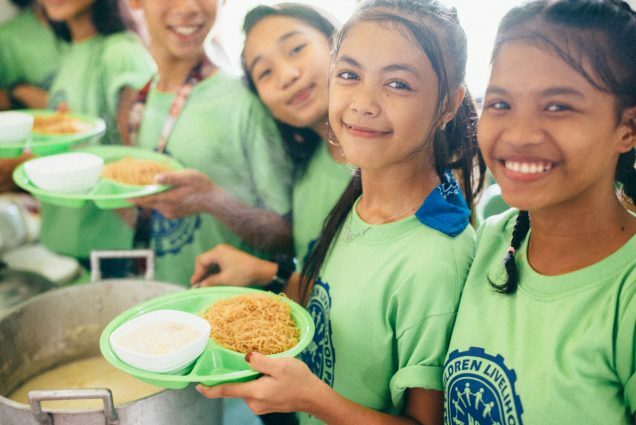 Because of a lack of financial support and Liezel’s family’s situation, she cannot pursue her studies this year and is helping our Manila director sell street food — this provides $2.00 for Liezel’s allowance every day. Liezel has 2 sisters — one is in 7th grade and one is in 9th grade. They are the only 3 children of their parents and are all active members of our Hope Center after-school program. Liezel’s mother left in 2005 when she was 5 years old, and her mother never returned. Thus, Liezel’s father and grandmother raised her and her sisters. Her father is a computer technician who earns a salary of $60 a month, but he holds an on-call position — it is not a steady, permanent job. Liezel’s grandmother acts like a real mother to the girls, and she is a scavenger at the age of 58. Her grandmother earns $2.00 a day from scavenging and this helps feed them for one day. And Liezel wants to tell you that she’s thankful to have your support because she learned a lot in the Hope Center academic tutoring, she learned important life values from Saturday’s and Sunday’s Bible studies and community time, she has improved her talents, and enjoyed different food that is rarely prepared at home. She extends her gratitude for all the donors who spread their love to the Payatas Children. In other news, 15 of our children (ages 9-16) at the Manila Hope Center enjoyed tambourine dance training in October. The children will perform the tambourine dancing every Sunday during their local church gatherings, and also in presentations before the daily Hope Center activities begin as an ice breaker for the other children. We are continually thankful for your prayers and generous support which makes all that we do for these children possible.